This cube figurine paper craft template was submitted by Arif Cahyadi a "PERI Jogja" member. When he searched for Euro mascot paper craft on the net, he only found Slavko then he thought about building it but he finally decided to make his own version both Slavek and Slavko. Arif said this is his first attempt on creating paper craft, so he choose cube form, the easiest one. The template is in PDF format, 4 pages template and 1 page assembly instructions. A display stage also included in this file. 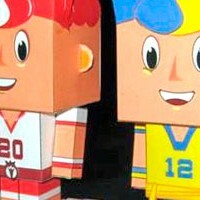 I say Arif is clearly inspired by cube paper crafts that are around on net. These two simple paper crafts are commissioned by Axioo Indonesia to be their paper craft kit for their promotion on roadshow or a workshop. Axioo already has three program for education one of them is program for teachers, they called it "PC for Teacher", it help teachers to have a affordable personal computer to develop their teaching and knowledge. 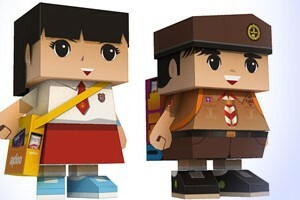 These paper crafts resembled a girl wearing elementary student uniform and a boy wearing a boy scout uniform. This Dolphin papercraft templates made for promoting Stop Dolphin Traveling Circus campaign by Animal Friends Jogja in Indonesia. They had successfully stop Gadjah Mada University to cancel its Dolphin Lab in the beginning of this month. Now they still continue their effort to close down traveling circus that involving dolphins. 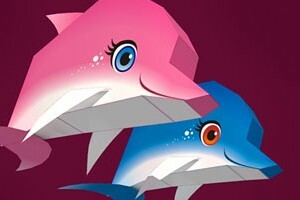 This dolphin craft is very easy and fun for kids. Support their cause here. 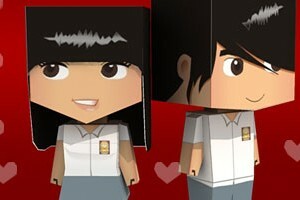 Still related with Valentine's day, I make this high school boy papertoy to match with previous high school girl. The boy papertoy has less parts compare with the girl. I still use letter size format for the boy patterns to match the girl's. White shirt and blue gray pants and skirt is a typical Indonesian high school uniform. Even there are some schools that use different uniform but they still have to include the white - grey uniform at least one day in a week. I love girls in uniform. 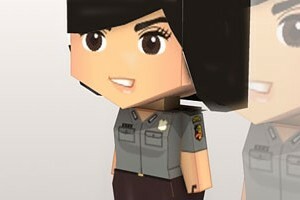 I got this idea when I saw a picture posted by my friend in a forum, it was a photo of a police woman posed with her fellow officers, they look pretty and cute, so I made this papercraft / papertoy. Indonesian Police Woman or Polisi Wanita (Polwan) was first established on September 1st, 1948. Until 1998 there were 5 Police Women promoted into commanding position as police chiefs, one of them is a Police woman with 1 star high ranking officer.